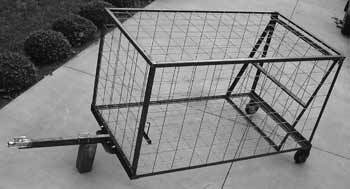 HOG TRAP DESCRIPTION: This heavy duty hog live trap is the same design as our original hog trap except it has wheels and a towing package. 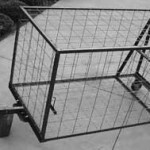 THE HOG TRAP ATV MODEL" now comes in both "STANDARD" and "DELUXE" (w/ATV HITCH and WHEELS). These features enable the trap to be hooked to an ATV or Tractor and can then be pulled around as needed. We have two styles of this "wheeled" version. One is equipped with 7 inch wheels and designed to be pulled over terrain which is mostly solid and flat. The Deluxe model has wheels which are 10 inches wide and is better suited for rough or muddy terrain. Both our wheeled versions come with the "Bait Pipe", along with a pair of rubber gloves. The gloves should be used to help keep human scent off the bait once you get the trap out in the field and are ready to make a set. Also the wheeled versions come with an ATV hitch and rebar stakes for securing the trap to the ground. These models feature solid wheels, along with a 1 7/8" Ball Receiver and tow bar so it can be hooked up for easy trailering. RECOMMENDED BAIT: Corn Though 25 lbs would be enough for most sets, using 30-40 lbs is a better idea – especially if you have more then one pig you want to trap.